Hanesti wore a short kirtle of diaphanous crimson silk that clung to the contours of her supple, slender form, well suited to the heat of the day that year around settled upon Metsheput. Her skin was bronzed, as it was for all native Metsheputi, though few there could rival the beauty that graced her, with dark hair spilling down in carefully sculptured ringlets, and dark eyes brought forth and highlighted by cosmetics. Exquisitely worked gold thread bedecked with pearls hung about her neck, while strings of them had been woven through her dark tresses. That day, though, she wished that she had worn something heavier, for a tremulous chill passed through her. The day was fair with a warm breeze blowing from inland, from the deserts. The weather had no part in the chill. Instead it came from the sight that lay spread out before her. The remnants of a town smouldered, with curls of smoke drifting up to greet the azure sky. Around it, as far as the eye could see, was a field of butchery, of townsfolk cut down as they attempted to flee to safety, their piteous forms strewn through fields were they had fallen. Some had been hung up from the shattered wooden palisade that had surrounded the town, while others had been beheaded. Along the road that led up to the broken gates into the town, the heads had been mounted on stakes, lining the way, serving as both warning and threat. The dark forms of carrion birds circled thick above, drifting down through the smoke to resume their feasting upon the fallen, only having risen after being disturbed by the arrival of Hanetsi’s army. That army spread out before the ruins of the town, waiting in their serried ranks. The bronzed nobles of Metsheput led the way in their swift chariots, perfectly suited to the plains and rolling hills of Metsheput, but of little use in the jungles of the south. Behind them stood the ranks of the infantry, men in leather jerkins and steel skull caps, with shields and broad spears. The host was backed up by many mercenaries; horsemen from Hashala equipped with scimitars and horsebows, black men from the southern kingdoms, whether Kurushu bowmen or Agakwa skirmishers with slings and sharp knives, or the hired mercenary bands that recruited from across the nations of the Swordlands to the north. Hanetsi turned, her face ashen from shock, to look upon a tall, powerfully built black man who stood alongside the throne, who hailed from Kurushu in the far south. A lion skin cloak lined with crimson hung around his broad shoulders, the mark of a general in the armies of Metsheput. Hanestsi returned her gaze to the destruction wrought before her, as much as she did not wish to, almost unable to take in the scope of what she saw, and almost disbelieving that it had come true. There had been the dreams, yet at first she had hoped that they had been no more than nightmares, and even then, they had merely been of a dark cloud that had rolled up out of the south, from the jungles, to shroud the southern towns and cities. Now she could see that the dreams were more than that, and that she was afflicted, much as her ancestors had been. 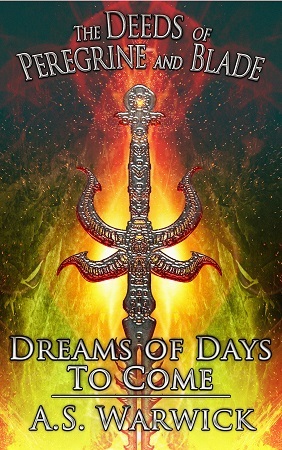 From the earliest days of the kingdom, her bloodline had received prophetic dreams that foretold the future, enabling the kingdom to survive in the face of tumult and turmoil, and yet it had been a blessing that at the same time bore a terrible curse. Those that received the dreams died soon after, a heavy price to keep the kingdom safe. Now her turn had come, just as she had always known it would, and now all that remained was to have the courage to face the inevitable, and to save the kingdom. The meaning behind the dreams may have become apparent, yet the agents of the destruction were not as she expected, for the carnage she saw was unlike anything that the wild men had been able to accomplish before. Theirs was the way of ambush, brutal and effective, raiding farms and travellers. Never before had they sacked an entire town and put its people to the knife. From nearby came the sound of laughter, a woman’s laughter, and Hanetsi turned to look at what had provoked it. There stood not too distant a band of rough looking warriors, drawn from a host of nations; mercenaries all, in the employ of Metsheput. One stood out from the rest, not merely because she was female, but for the hue of her hair, a rich auburn that seemed alive among the mostly dark hair about her. With her was a tall man, his long face somnolent in manner, and clad not in the hard wearing leather and chain that most mercenaries wore but in costly, colourful and well crafted clothes. Hanetsi’s eyes widened as she spotted the woman, for though never before had the pair met, the woman’s face stood out vivid in her memories. All the vague fragments of dreams came rushing back to her, of the flame haired woman who stood holding the darkness at bay as it flowed forth from the jungles. Hanetsi extended the golden sceptre she carried and pointed it towards the woman. “I would speak with that one,” she announced. “As you command, my Queen.” The general motioned with his hand, indicating to a pair of the guards that they should follow him. They strode across to where the mercenaries were gathered, their carriage that of those expecting trouble. Hanetsi watched on as the general addressed the auburn haired woman. After a moment, the mercenary turned to gaze across at Hanetsi. The look that she gave was unlike any other the queen had experienced before. It was a cautiously judging look, one that lacked the deference to which she was accustomed. Then the mercenary woman shrugged, and she and the tall man with her accompanied the general back to where Hanetsi waited upon her throne. That this Fianna was of the Aedring hardly surprised Hanetsi, for they were a primitive people, little more than barbarians, and among them the women fought as often as the men, an occurrence seldom seen in more civilised lands. “You track them to their lair and end them there,” Peregrine replied. Cold was her tone and ominous her words, yet self assured.